22 October 2014, at 12:00a.m. A study at the University of Arkansas reveals that two-thirds of the water used in pig production in the US is linked to the production of crops for feed. The goal of this study was to analyse water use in the US pork industry using Life Cycle Assessment (LCA) methodology, according to Marty Matlock of the University of Arkansas in a report for Pork Checkoff. LCAs are quantitative analyses of complex systems for the evaluation of impacts and risks associated with management decisions. LCA can be an effective tool for determining comparative advantages of management strategies across specific environmental impacts of concern. The environmental impact category that was used in this assessment to evaluate processes throughout the pork supply chain was cumulative water use (gallons). This assessment was performed at two scales: a cradle-to-grave scan-level analysis and a cradle-to-farm gate detail-level analysis. The Pig Production Environmental Footprint Calculator (PPEFC) was enhanced with water consumption algorithms based on data from peer reviewed scientific literature. The PPEFC was then utilised to estimate the lifecycle inventory of water use. 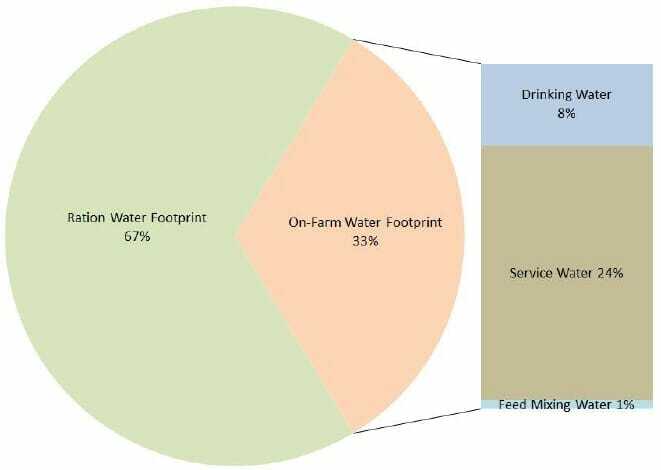 Among the findings that the largest components of water consumption in the pork production process are crop production for feeds and the live swine production facilities. Distribution of blue water use in US pork production (excluding post-farm gate). Service water refers to cleaning water, washing water and other services necessary to maintain environment. Ratios were calculated based on global datasets and methods from Mekonnen & Hoekstra (2011).